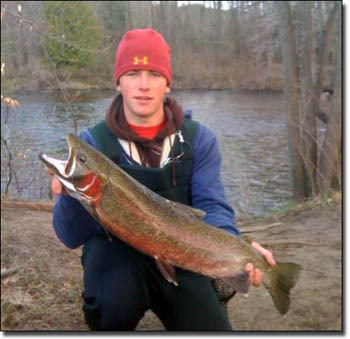 Treat yourself to some of the best big lake and river fishing in the state of Michigan. Should you be fortunate to bag your trophy buck early or just want to take a trip before your evening hunts, we have lots of fishing places to visit and sights to see. 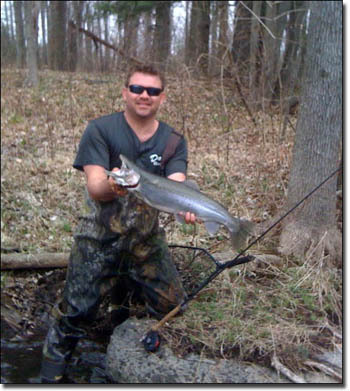 Enjoy fly fishing on the world famous Pere Marquette River, only a short walk away from Rhino Hunt Club; Or see what is biting out on Lake Michigan, 30 minutes away. Guides and charters can be arranged upon request! The State of Michigan has over 300 named rivers. Here's a link to all of these rivers. Michigan has over 11,000 inland lakes. See a listing of the 20 largest lakes in Michigan. There are approximately 829,000 boats registered in the State of Michigan. These maps show distributions of fish in Michigan, both historical and current.